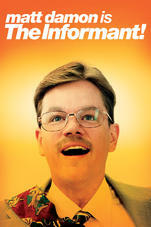 Conventional wisdom recognizes that The Informant is a breezy take on the case of Mark Whitacre (Matt Damon), a whistleblower from the early ’90s who ratted out his global agribusiness firm to the federal government as part of a price-fixing investigation, while embezzling millions of dollars and lying through his teeth like a bad hairpiece and tie (both of which he wore everyday to glorious effect). As the story unfolds, it becomes obvious that Whitacre was crazy as a loon, an unbelievably comic figure narrating his own downfall on hundreds of tapes to the FBI. With The Informant, Steven Soderbergh picks up the true-life caper baton from Steven Spielberg, whose Catch Me If You Can was a low-key charmer from a director seemingly incapable of such minor efforts anymore (his very name implied, directly and boldly, big solemn statements), and bolts to the great beyond on a trail of laugh-induced tears.